I am seriously considering this 1963 Fairlane. The color is puke, but it has fins. The '64 for sale in Illinois does not. This other '63 needs paint and body work and is a coupe. I think I like the four-door better. It has more class. If I didn't have stuff to do this weekend, I would drive up and kick the tires on that '64 in Illinois. It's just over the border from St. Louis. You should read the entire thread. Too much damage and the repair & shipping costs would have been an extra $1,000 at a minimum. Do you have the shop manual already, or did you just get the supplement? I don't know why it says "supplement", but that is the shop manual. It has a complete table of contents and covers the entire car. I guess I'll find out later if I screwed up, but it's the only thing for sale. I seem to remember seeing them both ways. Sometimes the supplement is separate, and other times it's listed on the cover, because the printing has been updated to include it. How many pages does it have? I read the description again. 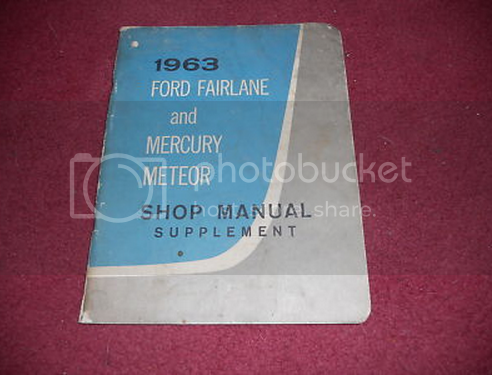 It is a supplement to the original 1961 factory manual that only lists updated items for the 1963 model. Oh well, it can't be that hard to figure out. Ford's drum brakes aren't any different than Chevrolet's. Everything works except for the radio and the horn. The car has brake lights now. The pedal switch needed to be replaced. I've been looking for headliner hardware. Finding the upholstery is easy... the bows that hold it to the roof are a little more difficult. I found some for a '64 wagon, but they're color-coded for the correct shape and placement. I guess there's not a lot of money in reproducing the hardware. It looks like the windows have to be removed to install a new headline but the weatherstripping is damaged and needs to be replaced anyway. The guy I bought it from patched some leaks with silicone. Found some Mustang ribs for $35. The Falcon/Comet/Mustang/Fairlane/Torino are all vaguely related. Maybe they'll fit. "Practice random violence and senseless acts of brutality"
If you want a gender neutral bathroom, go pee in the forest. Been there... I've checked half a dozen sites and none of them have the headliner ribs. Bummer. Looks like the "modify something else" is the only choice. 24 hours late, but I got it home. My impressions after driving it the car for 100+ miles. The gas tank is full of crud, enough to clog two filters, and will need to be removed and cleaned. I had the car towed thanks to roadside assistance and a local garage replaced the fuel filter and took me to a hotel (the previous owner left a new filter/gasket in the back seat but never replaced it. Go figure). I made it home but as soon as I got off the interstate and slowed down the car immediately bogged down and started sputtering. I let it sit for an hour, long enough for the sediment to settle to the bottom of the fuel filter and got the car parked in its temporary home. The speedometer is off by 10-15 miles an hour. The coolant temp gauge doesn't work, or the thermostat is not working. There is wheel shake over 60 mph and the car pulls to one side -- I'm thinking this car needs new tie rods and an alignment. The weatherstripping around the doors needs to be replaced. There is an enormous amount of wind noise around the doors. The spark plug/ignition wires were so old and crusty the car wouldn't start back up if you turned the car off while they were hot. It also ran like crap. I put on a new set of wires, but I think this thing will need a new set of points and plugs as well as a valve check/adjustment and probably a new needle/seat for the carburetor. The good news is that the rods for the headliner are still in the car and the dome light works. I overlooked those last week. The front end on this car is pretty bouncy. I was expecting a more plush ride once I got it out onto the road, but it does feel overly-sprung. Suspension is torsion bars and coil over shocks. Jerry said he replaced the shocks but I'm wondering what kind he used. The rear is pretty bad. I took a steep off-ramp on the interstate and the rear end felt like it wanted to lay down and go to sleep. 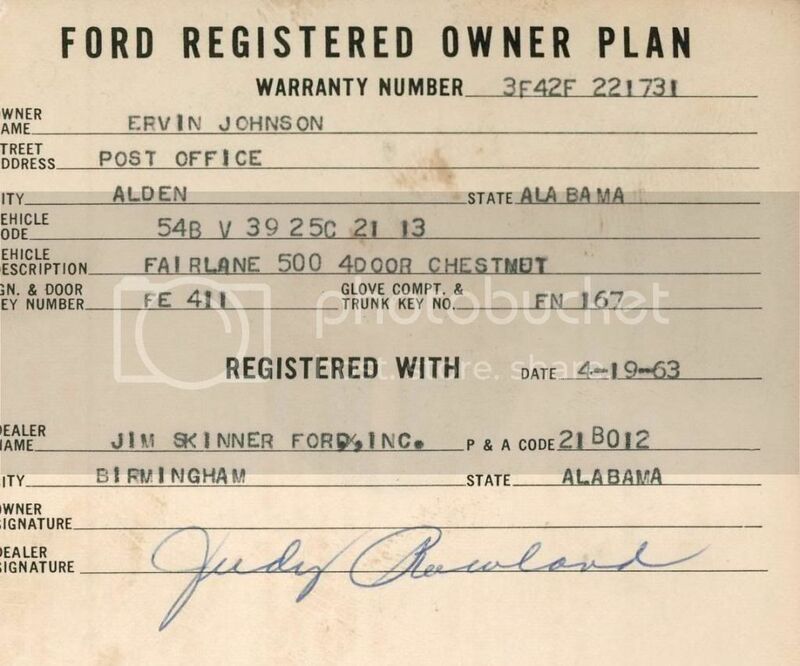 Seeing that typewritten owner card brings a wave of nostalgia for the olden day type writers. Even the less antique style typewriters like the IBM selectric. Chris if u decide to drop the tank make sure you can get gas tank straps. I have a crappy tank on the 'cuda and should probably do the same thing but haven't got around to it in 12 years. I use a clear inline filter and change it frequently. with such a sage should one consort. Any tips on DIY tank cleaning? I've never had to do it. What are the odds that there's a bunch of rust in the tank? At some point in the game, cleaning becomes impractical or impossible and replacement is necessary. Have you priced the cost of a replacement tank? I was just looking at the filter I changed the other day it was nasty. It is about 90 here today, I took a quick spin around and popped the hood when I pulled in to check the new filter. Not quite as nasty but not that great either. I may post a couple pics later. The filter was quite warm as well as crappy. I have seen new tanks for the 'cuda on Ebay and specialty shops so I would probably go that route but I figure cleaning would involve something like BB's and shaking around. Saw one guy say he used toilet bowl cleanser, another hydrochloric acid, another vinegar. $250, which is about normal for a reproduction tank. The straps are another $70. Toilet bowl cleaner? Never heard that one. At this point, I'm just going to drain the tank, flush it clean, and see what progresses from there. I might even try the toilet bowl cleaner. It just needs a little work. Have you considered Por-15's tank sealer? I think it's around $75 or so. It comes with all the chemicals and stuff to remove the rust and seal it. We did this on my brother's B, and it turned out good.